The house dates back to 1911, a rarity in this land of new-builds, and it has all the features beloved of Altbau buildings. Entering from Goslarer Platz 6, you are immediately welcomed by an atmospheric barrel vault and historic mosaic tiles. The building was renovated and modernised as recently as 2017/2018, melding classic style with modern convenience. This 125sqm Altbau apartment is a dream come true for individualists and those with a flair for design. Since the unit is still under construction, you can design your new home entirely according to your wishes. The apartment not only provides enough space for a family, but also has plenty of charming features, such as a sunny, west-facing balcony and an authentic old stove in one of the rooms. In short: anyone who loves the style of old-fashioned Altbau buildings will be more than happy here. 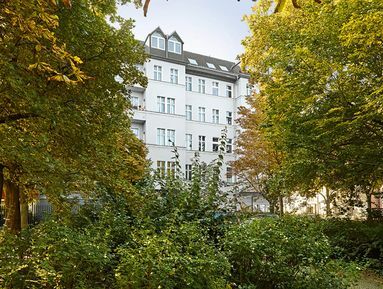 Surrounded by the River Spree and several canals, Mierendorff Island is a secret hidden in the middle of sophisticated Charlottenburg. This is an area of artisanal craftsmen and weekly farmers’ markets. Yet it is not completely cut off from the world around it; the many waterways are traversed by numerous bridges, and the island has its own subway station. Many of Charlottenburg’s highlights are located within comfortable walking distance; you can easily go for a jog through the gardens of Charlottenburg Palace, before an evening at the opera. The only limit is your appetite for discovery.